Despite a miasma of doom and gloom that often comes from current news, be reassured that Mayberry still exists somewhere, that everything will always come out all right for The Beav, and that there is some joy in Mudville. 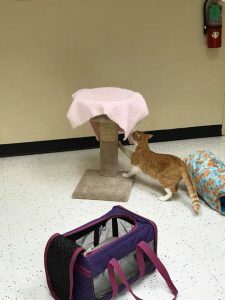 About three months ago, a young orange-and-white cat named Coraline was adopted from the Helen Sanders CatPAWS rescue by a couple from Rossmoor, whom she’d charmed. A week or so later, CatPAWS got a call from one of the couple, who said that they hadn’t seen Coraline in the house for a couple of days. An open window on the second floor without a screen bore witness to where Coraline had disappeared. Without a look backward—or much of one—CatPAWS sprang into action. That Coraline be found was foremost. Facebook and Nextdoor exploded in frantic posts in several neighborhoods. Nextdoor members Jill Thorndyke and her mother, Katherine, printed out flashy, professional fliers, and the organization’s volunteers and supporters papered the posts and poles in Rossmoor down Wallingsford to Wimbleton. 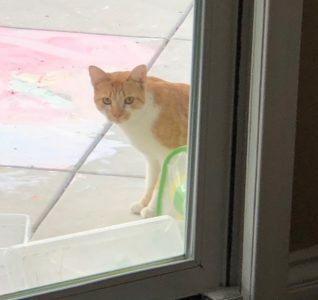 Residents opened their mailboxes to find Coraline’s mug in them, and diners and shoppers at the Shops at Rossmoor looked up from their plates and purchases to see her photograph staring at them through the window. Everyone had to notice the $1,100 reward that CatPAWS offered for her return, but no one claimed it. Coraline seemed to have disappeared, like the cat in the eponymous movie. After several weeks, Coraline’s mentors tried to avoid despondent thoughts of coyotes and cars, and hoped that Coraline had been picked up by some well-meaning soul and kept as a pet, disregarding the bounty on her pointy-eared little head and the knowledge that a group of people was desperately looking for her. “We were pretty close to giving up hope,” CatPAWS member Annelle Baum said. This went on for two full weeks. Finally, one very quiet morning at 7 a.m., Coraline poked her head around the sliding glass doorjamb, and both Athen and his mother spotted her. Mom Krissy grabbed her cell phone, took a photo, and contacted CatPAWS. Got any catnip? Photo by Krissy Brownell. Turns out that the more hopeful scenario was correct—someone in the area had apparently taken in Coraline and fed her but didn’t contact the rescue, despite the ubiquitous fliers. Baum and co-volunteer Mitchell Cohen charged over in two separate cars, scooped up the errant Coraline and put her into a carrier. Missing for over five weeks, Coraline, zaftig and purring, was safe at last. CatPAWS and the adoptive family mutually agreed that she not be returned and that another adopter be looked for (that’s an unabashed hint). And yes, Athen got the reward, which was placed in his college fund. But there’s also a swell Norman Rockwell ending. Rosswell resident Sandy Mrvos, who had been active in the Nextdoor post, hosted an ice cream social in Athen’s honor. 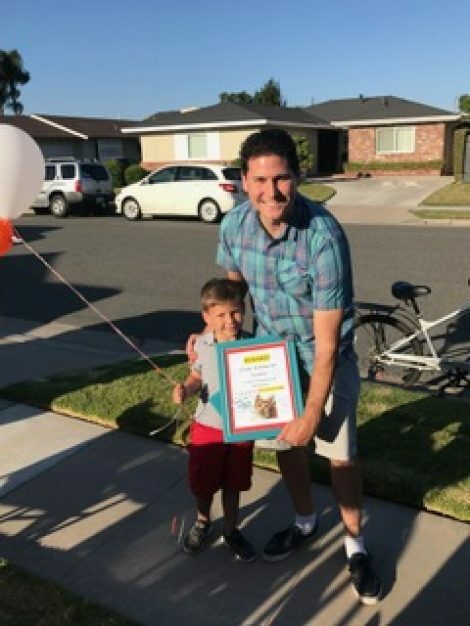 The young hero, accompanied by his dad Andrew, shyly accepted one of the Coraline posters, framed and signed by CatPAWS volunteers and neighbors, along with a couple of balloons. He seemed overwhelmed, as if he couldn’t take in that it was all for him. Athen Brownell, with dad Andrew, bemused and pleased. Photo by Kate Karp. “It was great—a lovely community effort,” party guest Cindy Woods said. When Athen accepted his check the previous week, he told Baum that he wanted to give part of the money to cats and dogs in need. “You’re raising a wonderful boy,” Baum told the Brownells. The credits roll. Is that the whistled strains of “The Fishin’ Hole” in the background? Second time has to be the charm. Coraline is available for adoption to a loving home and may be chatted with at the Petco in Marina Shores, 6500 Pacific Coast Highway, Long Beach (corner of Second Street and Pacific Coast Highway). FYI, Athen is not available.